The number of African American Children’s Book authors published in 2007 has declined nearly 12% since 2006! The Cooperative Children’s Book Center (CCBC) at the University of Wisconsin, Madison has tracked children’s books by and about people of color in the US since 1994. 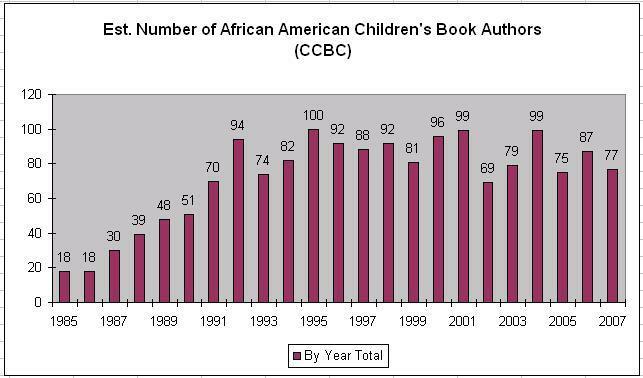 Its study of African American children’s book authors goes back further to 1985 (based on the books received by the CCBC). Recently the CCBC released the 2007 stats – an estimated 77 children’s books by African American authors were published in 2007 out of an estimated 5,000 children’s books published! What’s happening? Is there anyone talking about this decline in publishing circles or on the Internet? Have you read these CCBC statistics in the news? Did the CCBC send out a press release on these stats? Are authors of color just producing less? Or, does it just not matter? There are several self-published children’s book authors. Heck, I’m one! As part of the marketing of my book, Martha Ann’s Quilt for Queen Victoria, I donated a copy to the CCBC to ensure that I was counted… and to ensure that an organization that promotes and studies children’s literature has my book in its catalog for future readers. Ensuring that institutions that teach children’s literature have your book, especially books about kids of color, in their libraries is important. Is there a sense that the number of African American children’s book authors published in 2008 will increase? What say you? Kyra Hicks is the author of Martha Ann’s Quilt for Queen Victoria. For more information pertaining to literature of particular interest to Black children, see her blog. Thank you for keeping us informed. It’s disturbing that the number of books by African-American children’s book authors has declined even from the terribly low 2006 statistic. I hope our numbers will rise in 2008. It’s a tough economy and a challenging time for the children’s book industry. We need parents, teachers and librarians to support our titles and let publishers know that our books sell and matter. Children of color deserve stories that speak to their history, dreams and experiences. Kyra, thanks for an informative blog. I didn’t know that I could donate and have my self-published books counted so I will take care of that pronto. It is very disturbing to see the number go down from one year to the next and it was a pretty big jump at that. Thanks for this post. So informative. So important. The first step is informing. Thanks Kyra for diligently staying on the most current stats. I don’t know if we can impact increasing that number or not, but we can certainly do our best to ensure folks know about and support the books that are being published lest the industry think these books aren’t in demand. Would be interesting to see if these stats have improved since Obama? I think that’s a good point. Since former President Obama made history for being the first African American president, I would at least think the statistics would improve. I feel like the schools and libraries that should promote these African American authors would need some sort of push to encourage the readers to be involved in promoting these authors and with the presidency of the former president, I would expect it to spark some sort of motivation for the authors to continue publishing. Personally I feel like the reason why the number of African American books being published is declining, I would assume is because the lack of African American books being read within the schools, public libraries and within the home. If African American books aren’t being read or published chances are diversity can be an issue. Unfortunately we live in a society where diversity is frowned upon and the more closed minded people become they tend to shut out the important issues such as accepting race, ethnic background etc hence the decline of the publishing of African American books by African American authors.